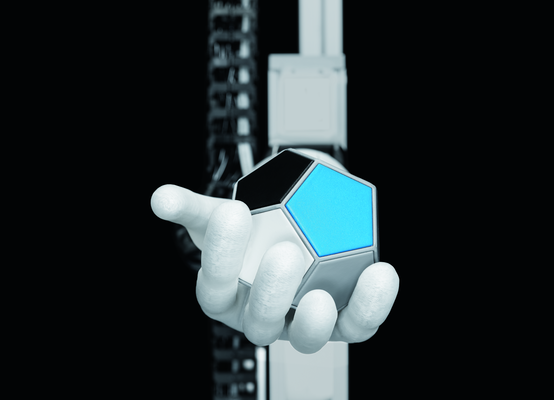 From 1 to 5 April 2019, Festo will be showcasing the new Future and Bionic Concepts along with further product innovations for factory and process automation at its main booth at Hannover Messe. How does anticipatory machine maintenance work? How is artificial intelligence advancing automation? And how can Germany as an industrial location benefit from these activities? Answers to these questions were provided by Dr Frank Melzer, Member of the Management Board Product and Technology Management; Tanja Krüger, Managing Director of Resolto Informatik GmbH (a company of the Festo Group); Dr Elias Knubben, Head of Corporate Research and Innovation; and Dionysios Satikidis, Digital Strategy and Business Model. Will automation become autonomous thanks to artificial intelligence? This question was put forward by Dionysios Satikidis, a software engineer and expert in artificial intelligence, in his opening presentation. He used the example of newborn babies to explain various learning methods in artificial intelligence that can ultimately lead to autonomy. Babies first of all perceive objects, and this enables them to recognise differences – which is exactly what algorithms can do in machine learning, for example when recognising anomalies or clusters. When systems also remember what they perceive, this is known as deep learning. They can then recognise objects or understand speech. If this memory is connected with a task and practised, one then speaks of reinforcement learning. In this case, it involves learning a skill. “Once artificial intelligence finally becomes capable of transferring acquired knowledge to unknown tasks, we will have arrived at transfer learning, which in the final stage can lead to autonomous automation,” said the expert with a view to the future. Dr Elias Knubben showed an example of how Festo can use reinforcement learning for automation engineering: the Head of Corporate Research and Innovation presented the BionicSoftHand, the new Future Concept from the field of bionics. The natural model for this gripper is the human hand. The BionicSoftHand is pneumatically operated so that it can interact safely and directly with people. Its fingers consist of flexible bellows structures with air chambers and other soft materials. This makes it light, flexible, adaptable and sensitive, yet capable of exerting strong forces. By means of artificial intelligence, the bionic robot hand learns to independently solve gripping and turning tasks similar to the human hand in interaction with the brain (see press release on the 2019 bionic projects). Artificial intelligence has been made usable to industry by Tanja Krüger, Managing Director & Owner of Resolto Informatik GmbH (a company of the Festo Group since 2018). This theoretical computer scientist, a pioneer in the field of data analytics, founded Resolto in 2003. Visitors to the booth of Festo at the Hannover Messe can see how the intelligent monitoring software SCRAITEC analyses and interprets data, and detects and reports anomalies, all in real time. The permanent data analysis also enables the system to constantly learn and extend its basis of knowledge, so that intelligent process monitoring is possible. “In Hanover we will be demonstrating how our software works in a showcase for the detection of faulty batteries. The batteries are lifted by a handling gantry. SCRAITEC monitors the engine currents and positional values of the axis. If anomalies occur, for example if the handling unit grasps the wrong battery format, a report is issued,” said Tanja Krüger. “The acquisition and monitoring of data by the intelligent software solution can either be effected at the component, as with the handling of batteries, or be carried out via the IoT gateway CPX-IoT in the Festo cloud. It connects components and modules from the field level, such as handling systems or electrical drives, via its OPC UA interface to the Festo Cloud,” added Dr Frank Melzer, Member of the Management Board Product and Technology Management. “The topics of analytics and artificial intelligence will enormously influence our product portfolio in future.